Published by The University of Georgia Press, 1986. This appears to be a first edition, first printing. Appears to be a new, unread copy. Light evidence of a price sticker removal on inside front cover. Includes the dust cover in excellent condition. Text from the dust cover: "In the colonial churchyards and burial grounds of Georgia and South Carolina stand eighteenth-century grave markers of nearly unequaled virtuosity and ambitiousness. Carved by the most accomplished New England artisians, the gravestones reflect the more cosmopolitan taste of the southern clientele and display little of the puritan severity that dictated the tone and motif of the markers found in northern colonial churchyards and municipal burial grounds. 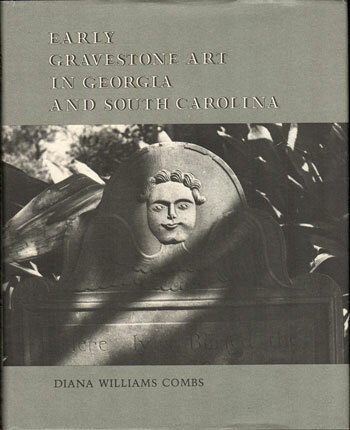 "Diana Williams Combs explores in the photographs and text of this volume the rich legacy of gravestone art still to be seen-in some cases surprisingly well preserved, but in many others weathered, chipped, or defaced-in the two states, and in particular in the coastal cities of Charleston and Savannah and in the towns of Midway, Georgia, and Georgetown, South Carolina. Combs discusses the techniques and styles of the individual carvers, comparing their southern markers to those executed for northern clients; traces common patterns of imagery, such as the winged soul's head that gradually replaced the winged death's head motif prevalent at the beginning of the century; and chronicles the transformations in taste and in the attitude toward death that gave rise to neoclassical elements in markers and that later, toward the end of the century, began the transition toward the sentimental conventions of Victorian gravestone art. "Many of the most significant works of the New England carvers appeared not in their native region but in the South. In addition, refinements in tomb art in England and on the Continent usually were introduced into the colonies through the South. The southern colonies, then were in in many ways central to the development of American gravestone art, and in their churchyards and town burial grounds can be seen the best work of the colonial artists who turned their skills toward the commemoration of the dead-who portrayed in stone the grip of death over the living, the sorrow of the survivors, and the ecstasy of the soul liberated from its earthly host." Hard cover, 246 pages with numerous photographs; a valuable genealogy or historical reference.